Predictions are a risky business. Advances in genome and genetic research – and some implications – were on display at this year’s American Society of Human Genetics conference (#ASHG15) with insights into the genome-based future of research and medicine. The Baltimore gathering showed how the massive volume of genome sequencing keeps producing new data sets, and prompting new questions ranging from cellular-level research lab to the doctor’s office. In cancer analytics, there is the possibility for integrating RNAseq and DNAseq methods for greater correlations, detailed by Dr. Elaine Mardis, of the McDonnell Genome Institute at Washington University in St Louis. Her goal is to eventually create cancer vaccines by combining RNAseq, DNAseq and HLA analysis. We saw genomic data sets that are delivering huge research value across multiple domains. For example, several projects used the Kaiser Permanente Genetic Epidemiology Research on Adult Health and Aging (GERA) to better understand everything from multiple sclerosis to diabetes and macular degeneration. Another area of interest were ‘n-of-1’ cases. One of the most unexpected studies focused on two astronauts, twin brothers Mark and Scott Kelly. One highly-specific project spans 10 different research organizations. Blood draws and sample sequencing in zero-gravity and sample deliveries from space are creating some unusual challenges for the brother (Mark) who is more than halfway through a year aboard the International Space Station. Closer to home, downloading data for analysis is being replaced by real-time global collaboration using shared data. 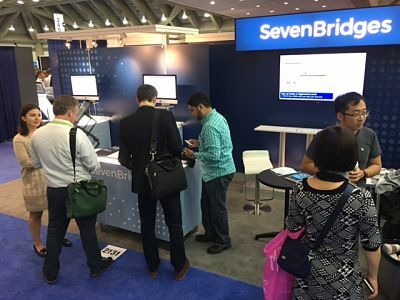 Several cloud-based initiatives were showcased at ASHG, including hackathons and instructional webinars for using cloud data from such providers as the National Center for Biotechnology Information, part of the National Institutes of Health. We can’t forecast the future, but do hope to meet you next summer in Vancouver at ASHG 2016.